Every summer when the Texas Parzens visit the California Parzens, our good friends Jon and Jayne at Jaynes Gastropub in San Diego let us bring a few bottles from my cellar to pair with their delicious food and share with our friends. This year, the flight included two bottles of Produttori del Barbaresco 2007 Barbaresco Asili. The wines were purchased on release and delivered to my wine locker in San Diego where they have been sitting undisturbed since they arrived. 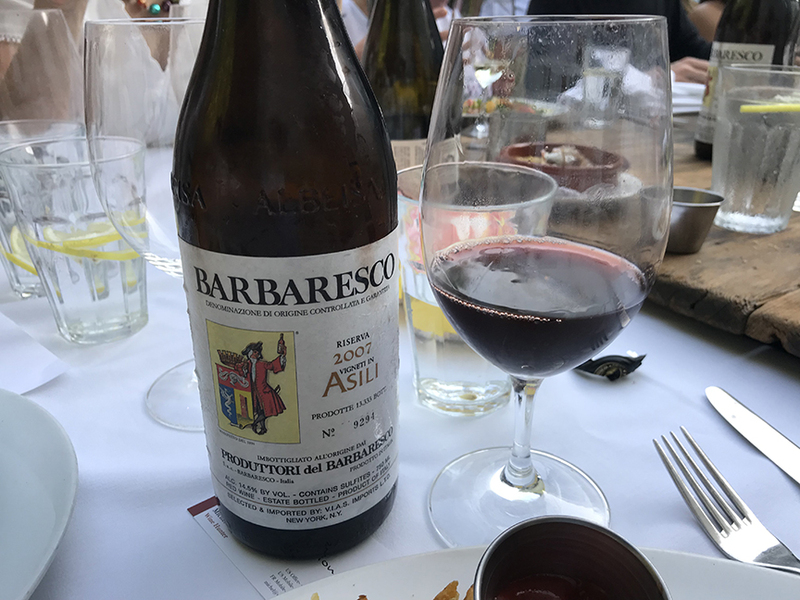 The 2007 harvest was part of a string of excellent-to-extraordinary vintages in the appellation (check out this superb article on 2007 in Piedmont by Antonio Galloni; he focuses on Barolo but he also offer some excellent overarching observations about 2007 in Langa). Tasted last year, this wine was still very tannic. It was already showing signs of opening up but it was still “tight” in wine collector parlance. But, man, when we opened it on Saturday early evening, every drop just sang as it flowed from glass to palate. My dining companions and I had dropped one bottle in an ice bucket to chill it slightly. The other was served room temperature (my preference). Both bottles delivered notes of delicate rose petal and berry fruit on the nose. In the mouth, the richer berry fruit was balanced by that ethereal hint of earth and subtle mushroom, all the while wrapped in a sheen of acidity. We followed these two with a bottle of 2008 Produttori del Barbaresco Barbaresco Rio Sordo. 08 is arguably the better vintage but that wine was “shut down”: the tannic character and earthiness seemed like a jealous new lover who doesn’t want to let its fruit dance. Still a great bottle but not nearly as expressive and nuanced as the 07 Asili. The latter is considered to be one of the appellation’s greatest crus while the former is one of its lesser growths. But given the closed character of the 08 Rio Sordo, I’m going to wait until next year to start revisiting my 08s. Parzen family drove our new Ford F150 to California at the end of July. We had a great time in my hometown of San Diego: visiting with my mom, spending time my brother Tad and his family, lots of swimming and beach, a rocking show with all my buddies (I dedicated my rendition of “Back in the USSR” to Donald Trump), dinner at Jaynes, dinner at Bahia Don Bravo (my favorite fish taco joint). All in all, it’s been a great trip. This week we’re driving back. 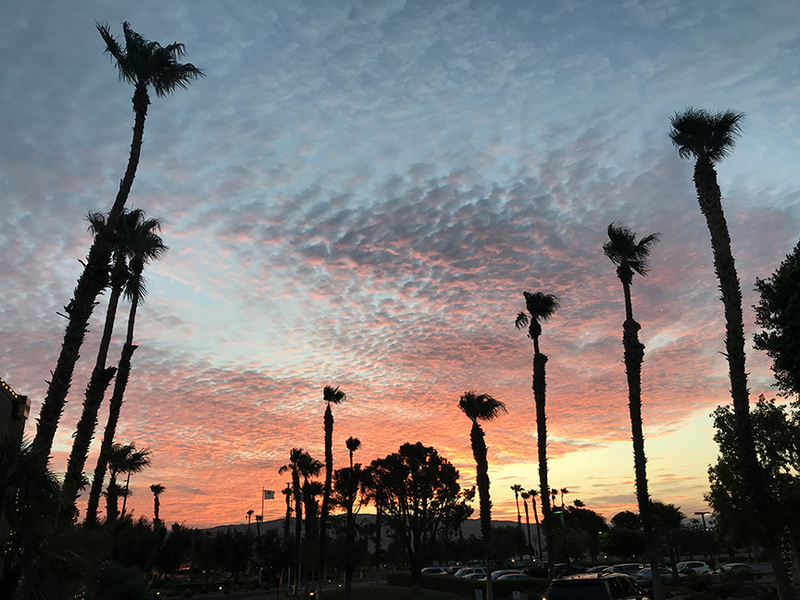 That’s sunrise, above, at our Palm Springs hotel this morning (I always get up super early to get work done before I take the girls to the pool). Friday we’ll be at the Grand Canyon. The girls have been so well-behaved in the car and have really picked up their parents’ love for travel (is it genetic?). I love the long drives, especially across the desert where I have time to think and reflect. And the best part is we are all together, all the time. That’s where my true joy is. Thanks to Parzen family west for a great visit and thanks to all my folks in southern California: I have the best friends a man could wish for. That’s the truth. There’s so much more to tell, including some great winery visits for the Slow Wine Guide.